To protect privacy, a monitoring system from the company MotionLoft turns people in its video images into anonymous white dots. The movements of of the dots can then be analyzed to help the Business Improvement District understand what people do downtown. Next time you pass through Downtown Crossing, Rosemarie Sansone will be keeping an eye on you. 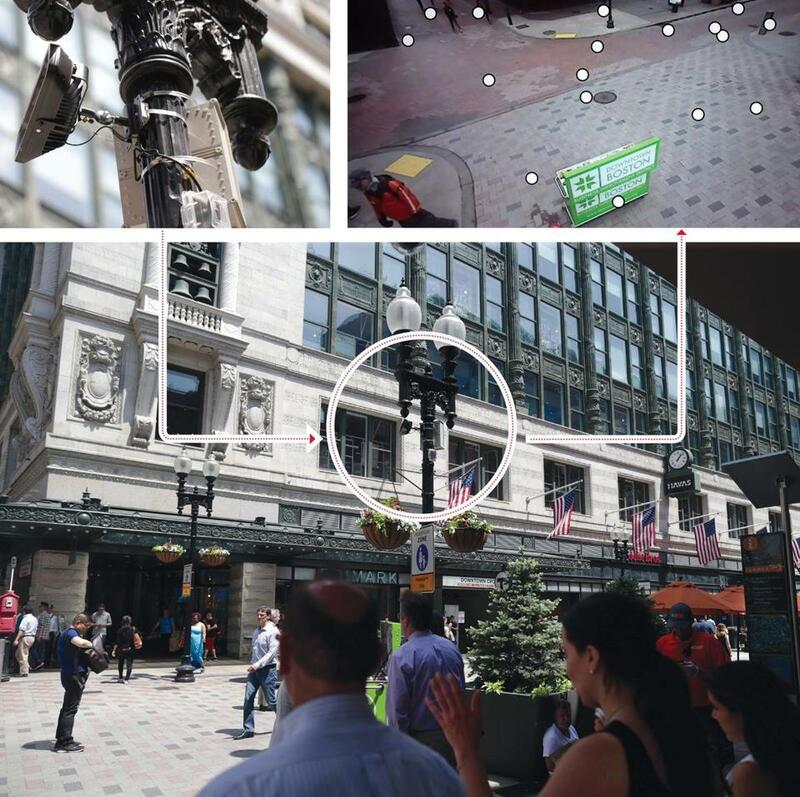 Her organization, the Downtown Boston Business Improvement District, is using video cameras to record traffic flows in order to fine-tune retail offerings in the busy commercial district. The business organization has installed video devices at 12 locations and uses technology to convert the images of pedestrians into digital data that shows traffic counts and concentrations at different times of day. The three-year, $130,000 effort should generate hard numbers that may be a vital sales tool for commercial property owners. The experiment is just beginning, but Sansone said the district’s merchants and property owners are already learning the area is busier than they had realized, especially at night. That could yield a business opportunity for restaurants that currently serve a lunch-only crowd, for example. The 300 members of the Downtown Crossing BID — mostly landlords who control about 700 properties in the district — are merely counting people, not spying on them. The system uses technology developed by MotionLoft, a San Francisco company that has a privacy-friendly system that visually monitors people and cars without actually watching them. MotionLoft analyzes images captured by the video cameras and, using a powerful graphics processor chip made by Nvidia Corp., converts the images into data points; people and vehicles are rendered as anonymous white spots moving across the landscape. The actual video images are immediately discarded and can’t be recovered, so there is no possibility of using the data to track specific people. The raw data reveal minute-by-minute traffic flowing through each monitored intersection and can be easily analyzed to reveal surprising patterns in a location that seems perpetually busy. How many people walk past the corner of Washington and Summer streets at 9 a.m. on a sunny morning, or cross Winter and Tremont streets at 8 p.m. in the rain? It sounds like trivia, until you’ve collected a year or two of round-the-clock data. Then the information is worth millions to merchants and real estate developers. “If you pick the right retailer, based on the kind of traffic you have at that location, it’s a win-win for both the tenant and the client,” said MotionLoft director Justin Miller. As the MotionLoft database grows, researchers may uncover any number of unexpected insights. For instance, more people enter the Downtown Crossing subway station at Washington and Summer in the evening than exit in the morning. Why? Lauricella theorizes that some commuters get off at other stops closer to their jobs, such as Park or State. But on the way home, they may walk to Washington Street retailers like Primark and the Roche Bros. supermarket to pick up a few items before catching the train. Insights like these could help city planners predict how the opening of large retail stores could reshape traffic patterns. The business group said its cameras can’t be used for security purposes. The Boston Police Department already has cameras in the neighborhood that constantly record 30 days’ worth of video that can be reviewed as needed by investigators. But the Downtown Crossing group said its data may help improve city services, such as deploying extra police or street cleaners in locations that have higher-than-expected traffic.